Pour milk in a shallow dish and place breadcrumbs in a second dish. Dip each of the pieces of chicken in the milk, then the breadcrumbs. Transfer to skillet and allow to cook through and brown on both sides. Add the broth to the skillet and bring to boil, whisking to remove browning from the skillet and into sauce. Add in the cream and pimientos, then cook until slightly thickened. Reduce heat then add parmesan cheese and basil. Season to taste with pepper. 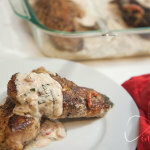 Remove chicken from oven and transfer to a baking dish. Pour cream into dish making sure to coat the chicken. Bake chicken and sauce at 325 for 20 minutes, flipping once halfway. This recipe is adapted from Taste and Tell.